The Bozeman Creek Enhancement Committee and the design team led by Confluence Consulting, TD&H Engineering, Intrinsik Architecture, Nishkian Monks, Vaughn Environmental, and Design 5 gathered for a ribbon cutting ceremony on June 22nd to celebrate the completion of the Bozeman Creek Enhancement project. 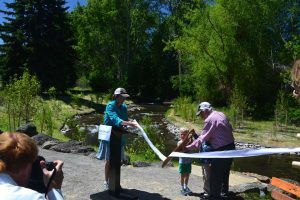 This project was established to improve Bozeman Creek through Bogert Park. Conceived in 2010, the project is the result of six years of planning, community involvement, fundraising, design and permitting. 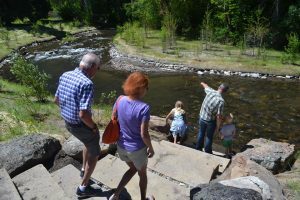 A top priority of the Bozeman Creek Enhancement Plan adopted by the City Commission in 2012, the Bogert project was the second project to be constructed using funding provided by the City’s Trails, Open Space and Parks Bond Fund. Originating in the Gallatin Mountains and flowing north to its confluence with the East Gallatin River, Bozeman Creek runs right through the heart of Bozeman. Since the City’s early days, the stream was narrowed and straightened, banks armored, and floodplain filled to accommodate development. Bogert Park is located on what was the most highly altered and impaired section of the creek, the one-mile reach on either side of downtown. The creek through Bogert Park was little more than a ditch with high and unstable banks, no floodplain and only a thin line of vegetation, offering poor habitat for fish and wildlife. The creek’s degraded condition discouraged recreational use. Its steep banks and linear, monotonous character were unattractive to most park users. The creek was difficult to access, presented a safety hazard during springtime high flows, and contributed far less than it could to the experience of park users. TD&H Engineering provided the topographic surveying, easement creation, drainage and rain garden design, utility and irrigation relocation plans, the specifications and bid documents, and the construction staking for this project.